If you’re looking for a finch cage or finch cage accessories then you’ve come to the right place. There’s a number of advantages to keeping finches in cages. Because finches are small in size, it makes them easy to look after as they do not require much food, they don’t produce much waste and their beaks are quite weak and unpowerful so they cannot easily bend the cage wiring. Their small size also means that one or two can easily fit inside of a small bird cage, so a number of them can be kept togeher in larger sized cages and aviaries. 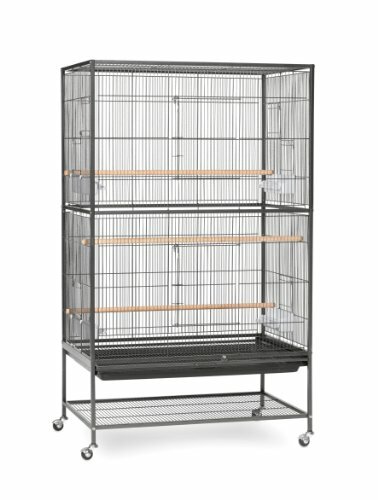 What to look for in a finch cage? Cage or aviary? Indoor or outdoor? Generally, you refer to a cage for smaller sized enclosures whereas an aviary is referred to for larger outdoor enclosures. Finches can be kept both indoors and outdoors though you should plan ahead for the hottest and coldest months of the year. For the winter months, outdoor bird heaters can be used. In very hot conditions, water misters can provide extra cooling if you have an outdoor aviary. Most finch cages are small and so you can buy them from as little as $40. If you want your birds to have more room, then flight cages tend to start around the $90 mark. However, if you want an aviary or much larger enclosure then several hundred dollars can be spent. There isn’t too much variation in size amongst the popular species of pet Zebra Finch, Gouldian Finch and Society Finches. 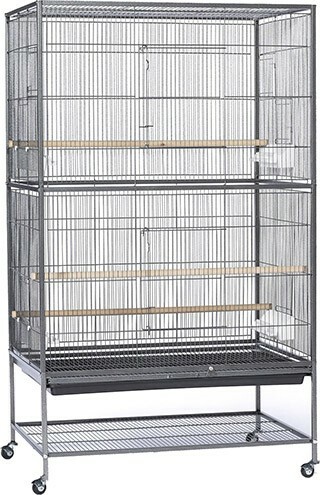 Because of this, most finches can use cage dimensions of the following sizes recommended below. The above is for a single finch, as you increase the number of finches, you need to increase this volume by 1.5 to 2 times the amount. You want the bar spacing on the cage to be at a maximum size of 1/2″. If you go any larger than this then you risk smaller sized finches squeezing out of the gaps. When it comes to the wire diameter size for the cage you want it to be at a minimum 2mm. Any smaller than this and you start getting wires that are so thin they can be easily bent and chewed by your finches beaks. 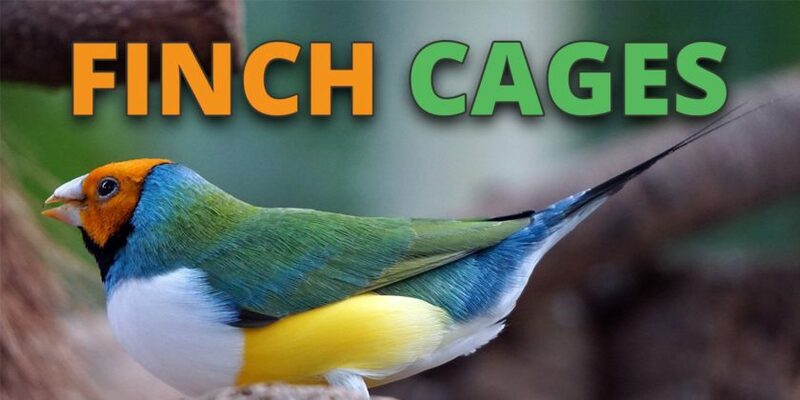 Finch safe materials that your cage can be made out of include acrylic, stainless steel, wrought iron and aluminium. Galvanized steel after welding is generally safe where galvanized steel before welding is not safe. Brands that have high standards of building quality include Prevue, Vision and A&E. There’s quite a few design features to keep an eye on that will make looking after your birds that much easier. A removable bottom tray makes cleaning the cage faster. Pivoting cage doors makes handling your finches in and out of the cage a simpler process. Plus easy access to the watering and feeding trays on the side of the cage is another factor to consider. When reviewing these cages the main factors we looked at were the build quality, design, size, cost and ease of use. From this we found out which cages were best and cheapest to suit your needs. 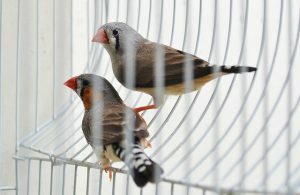 Fortunately for you, compared with other species of birds, finches and zebra finches tend to have cages that are on the cheaper on of the scale (especially when compared with parrot cages). The one thing to keep a particular eye on is the bar spacing and wire gauge size for finches. Because they are so small, you need to ensure that the bar spaces are small enough to keep the birds in, otherwise finches will be able to slip through the gaps of larger sized cages. Secure doors and access to feeding/watering trays with latches. Bigger than it looks and able to accommodate 2 small finches. Aesthetically pleasing and comes with a number of perches. Some user’s report difficulties removing and cleaning the bottom tray. Other’s have suggested a ladder is needed on the bottom so finches can access the feeding and watering trays more easily. Vision has hit the ball out the park with this one and created one of the best small sized finch cages available. A very spacious aviary that will allow you to house a small flock of finches. The double door protection prevents escapes. Built for outdoor weather conditions but can be used indoors if flooring is added. Plenty of perches for a number of birds plus access doors for feeding and watering stations. Cage doesn’t come with a bottom so should be placed on a hard floor or concrete. This is the ideal finch aviary that can also be used both indoors and outdoors. Huge in size, your finches will have lot’s of room to stretch their wings. 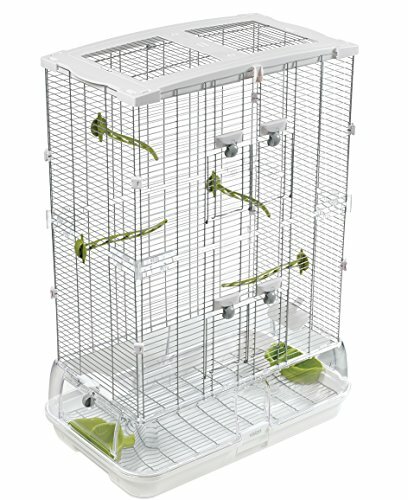 Large flight cage to allow your finches to stretch their wings. Extra storage shelf on the bottom is handy for keeping items. Lot’s of doors for accessing different parts of the cage. Wheels don’t lock so you may need to put something heavy next to the cage to prevent it from rolling. Assembly may require 2 people. Ideal if you want to provide your finches with plenty of flying space. Very spacious for a number of small birds with a beautiful and strong frame. The triangular look of the roof is more attractive than flat top cages. Plenty of room for additional perches and accessories. Good value for it’s size. Some people have reported shipping issues (although refunds and replacements are provided). Other people have reported issues with the bottom removable tray. 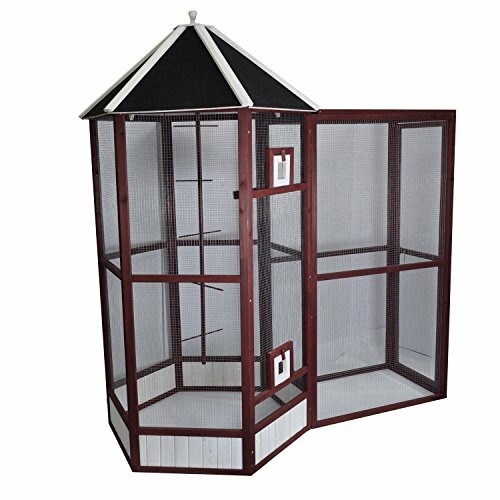 A well rounded indoor finch aviary that has all of the expected features. Perfect cages if you’re looking to breed finches. Middle divider can be inserted for 2 small cages or removed for 1 larger cage. x6 cages is a lot for the low price at which the cages are being sold. No nesting boxes but could be inserted separately. The go-to cage if you want to start breeding your finches. 6 cages should be more than enough to get you started. If you really need to buy a used finch cage then many people use Craigslist, Gumtree or Ebay – however it is not recommended. Firstly, there’s the potential for the cage to have been painted or treated with a toxic material such as lead or other types of harmful sprays – you won’t know the history of how the cage has been looked after. Second, the materials of the cage itself may be harmful and might contain galvanized before welding steel – which can be harmful. Third, cheap finch cages can be found secondhand but they often contain cracks and defects that you’ll need to maintain. Fouth, if your finch cage does become damaged then you’ll have no warranty so you can’t return it to the original company. All of these factors combine to make buying a used finch cage an option of last resort. Once you’ve bought your cage, you’ll want to kit out the inside of it with a number of items. A cage cover for your finches will provide them with a regular sleeping pattern and helps to avoid street lights and any motion detecting lights that could disturb your birds. To keep your finches entertained you can buy a number of different toys including ladders, shreddable and chewable objects, extra perches and more. The standard diet for a finch involves a seed mix which is full of rich Omega 3’s. Some of the most popular food brands for finches include Kaytee and Wagner’s. A nesting box is a good idea for your finches even if you’re not breeding them. It gives them an extra feeling of safety and protection. Plus, it helps to prevent finches from laying eggs at the bottom of the cage. M02 – Double Finch Cage from Vision. 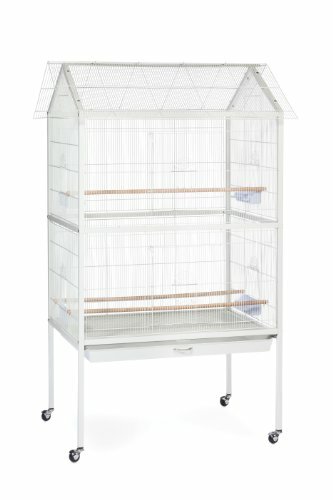 Advantek Portico – Walk-in Finch Aviary. F040 – Finch Flight Cage from Prevue. 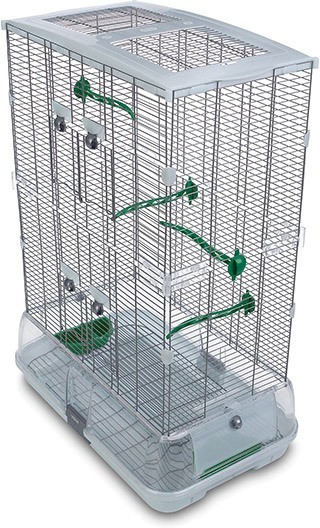 F030 – Triangular Finch Aviary from Prevue. 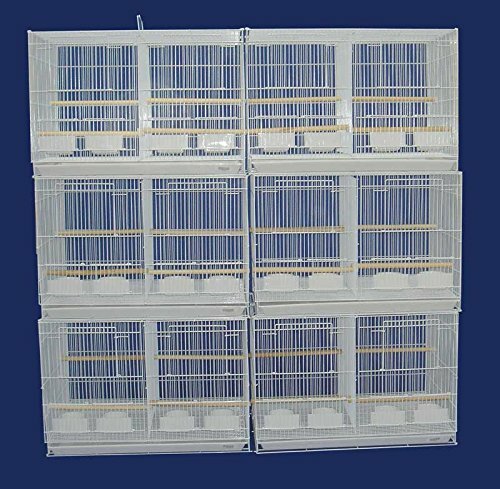 x6 Stackable – Finch Breeding Cages from Mcage. What’s your favorite finch cage, aviary or accessory? Let us know in the comments below. For more information on how to look after your pet finches check out our guide to Zebra Finches here. Thank you for this good, straightforward information. I am a new Gouldian finch owner and have been looking for information about quality brands, what toys are needed, if they should be xovered at night, food, etc. Your article answered all of my questions. Tha k you very much for your time and solid i fo. As a new bird owner, I appreciate it! Glad you found the information helpful. Enjoy looking after your Gouldian Finches and as a new bird owner I hope it goes well.